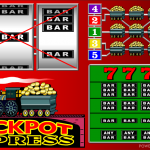 Jackpot Express is a video slot game inspired by old steam engine trains coming from the vast array of Microgaming games, but this time we have a classic slot in front of us. What comes in handy with this game is the fact that the train transports only one thing, gold. Play the game and bring the train in front of you and unload its goods into your bankroll. You will not see any unnecessary elements here in this online slot. The atmosphere of the game is classic and simple and you will agree with us that any game should be that way. 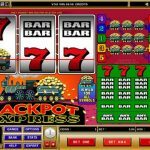 Jackpot Express is a very simple slot. When it comes to special symbols it has only one, the wagon symbol which has the function of a wild. It substitutes for any other symbol in order to create a winning combination. This symbol is the one that is the most rewarding in this game too, so you would like to see it the most on the reels. There are no special features like free spins or mini bonus games in this slot. This is all for one purpose only, to focus on the game and not be distracted while you play it. Everything you need is in front of you which sometimes is a big plus in online slots. Microgaming is the proud owner of some of the best classic games and Jackpot Express is on that list too. This slot is created by having in mind nostalgic players that miss simpler times. It is also a great game for beginners. The game play is simple and there are no overcomplicated features. 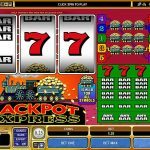 This way newbies can understand what online slots really are. Another great example of a classic slot would be Golden Dragon a 3 reel slot by MicroGaming.